We spoke with actor James Cromwell and fellow activist Pramilla Malick before the pair reported to jail in Orange County, NY to serve time on a civil disobedience conviction. Cromwell spoke with The Indypendent the day before heading to Orange County Jail. Together with five other protesters, the actor (Babe, W., Young Pope) was convicted of disorderly conduct on June 7 for temporarily blocking construction of a gas-powered plant under construction in Wawayanda, New York. Rather than pay a $375 fine and perform 16 hours of community service, Cromwell and two of his co-defendants have opted to serve a seven-day sentence behind bars while their attorney appeals their conviction. 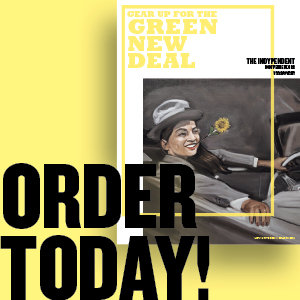 Cromwell, along with the five other members of the “Wawayanda Six,” as they have come to be called, contended that the dangers posed by climate change warranted their sit-in protest. Trial testimony from prominent climate scientists went unrefuted by Judge Timothy McElduff and the prosecution. 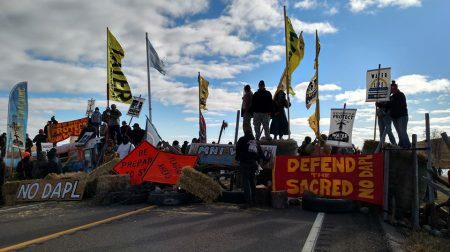 Rather, the judge found that because the sit-in took place in 2015, well before the powerplant is slated to be operational, the threat it posed to the climate was not imminent enough to support the activists’ necessity defense. 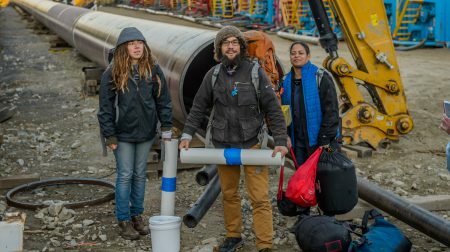 By not dismissing the defendants’ defense outright, Judge McElduff seemed to leave the legal door open for others to use a climate necessity defense in the future instances of civil disobedience. The 650-megawatt plant, to be fueled by gas fracked in Pennsylvania’s Marcellus Shale region, is set to go online next February. It’s owners, Competitive Power Ventures (CPV), are currently in the process of installing smoke stacks and industrial-scale ammonia and diesel tanks at the Wawayanda site. A compressor station attached to the Millennium Pipeline, which will connect to the plant, has already drawn complaints of sickening pollution from residents in nearby Minisink, New York since it was completed in 2013. Even as CPV builds the plant in Downstate’s pastoral countryside, a region which supplies produce to many of New York City’s restaurants and farmers markets, it is the subject of an ongoing federal bribery inquiry on the part of the U.S. Attorney’s Office for the Southern District of New York. Prosecutors allege Joseph Percoco, Gov. Andrew Cuomo’s former Executive Deputy Secretary, accepted $315,000 worth of bribes between 2012 and 2016 from two firms: CPV and, separately, COR Development. In exchange for the payments, Percoco awarded contracts to COR for economic development projects upstate and secured state approvals for the power plant in Wawayanda. Cuomo once described Percoco as a brother. Another Cuomo confidant, Todd Howe, lobbied for both firms. He pled guilty to arranging the bribes last year and is cooperating with investigators. Investigators say CPV executive Peter Kelly gave Percoco’s wife a no-show job in the firm’s educational outreach department at which she earned a total of $287,000. In addition to the bribes CPV has donated $82,800 to Cuomo since 2009. Percoco stands trial in January but so far the only people to go to jail in relation to the CPV’s power plant are Cromwell and fellow demonstrators: local Orange County grandmother Madeline Shaw and Pramilla Malick, who ran as a Democrat for State Senate last year on an anti-corruption platform. Malick’s Republican opponent, Sen. John Bonacic, ultimately won the race but was forced to donate the $4,950 in campaign contributions he received from CPV to charity when the bribery scandal came to light. Bonacic’s son, Attorney Scott Bonacic, helped draft CPV’s environmental impact statement for the plant. Invigorated by Bernie Sander’s call for a political revolution, Malick said her bid for state senate was an extension of the activism that led her to get arrested for blocking construction at the CPV plant. By stopping the CPV plant, Cromwell and Malick hope to thwart the spread of a growing outcrop of fracking infrastructure fed by a glut of gas in Pennsylvania. The use of natural gas further perpetuates our dependence on fossil fuels at a moment when large scale investments in renewable energy are needed to prevent the most severe impacts of climate change. Malick urges those who want to halt plant construction to sign a petition at protectorangecounty.org. They can also send comments to the New York Department of Environmental Conservation, urging it to deny CPV’s remaining water permits. Failing that more acts of civil disobedience will likely follow. 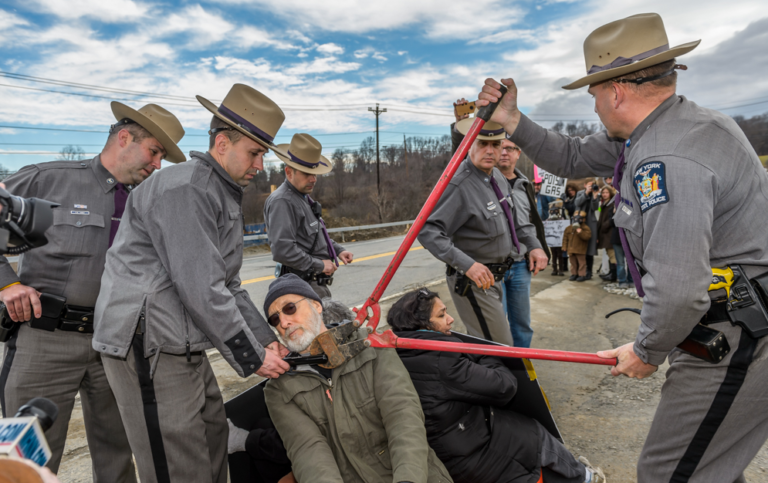 Photo: Police cutting a u-lock off of James Cromwell’s neck at a 2015 protest blocking construction of CPV’s power plant in Orange County. Credit: Erik McGregor.